Land Rover has launched a special edition model of the Discovery Sport, called the Landmark Edition at Rs 53.77 lakh, ex-showroom. This special edition marks Land Rover's first launch of 2019 and commands a premium of Rs 1.3 lakh over the SE variant on which it is based. The British automobile manufacturer has confirmed that the Landmark Edition will be offered only with the 2.0 litre Ingenium diesel that makes 177PS, and had been launched in India last month. Land Rover mentions that the 2019 Landmark Edition is available in three colours, narvik black, corris grey and yulong white, while a Carpathian Grey contrast roof will be offered as standard, irrespective of the colour option. Additionally, it comes with a sportier front bumper with Graphite Atlas exterior accents and 18-inch five spoke 511 wheels finished in gloss dark grey. Inside, the Landmark Edition is equipped with Ebony grained leather seats and an Ebony headliner paired with dark grey aluminium finishers around the centre stack. The diesel Pure trim of the Discovery Sport is offered with the 150PS and 382Nm 2-litre engine. The petrol variants continued to be offered in the 240PS and 340Nm version of the 2.0 litre Ingenium motor. The 2019 Discovery Sport already received a host of updates which includes exterior enhancements like a styling kit for the body, chrome-finished tailpipes and a Black Pack which adds a black grille, a black rear licence Plate plinth and a red 'Sport' badge. 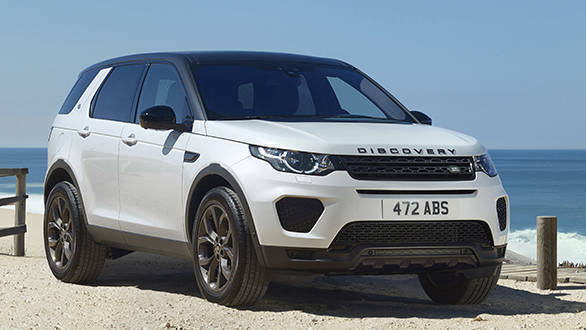 The Discovery Sport is already the most capable off-roader among its peers. This more powerful diesel option brings it up to speed with rivals like the BMW X3 and Audi Q5 in terms of engine spec.